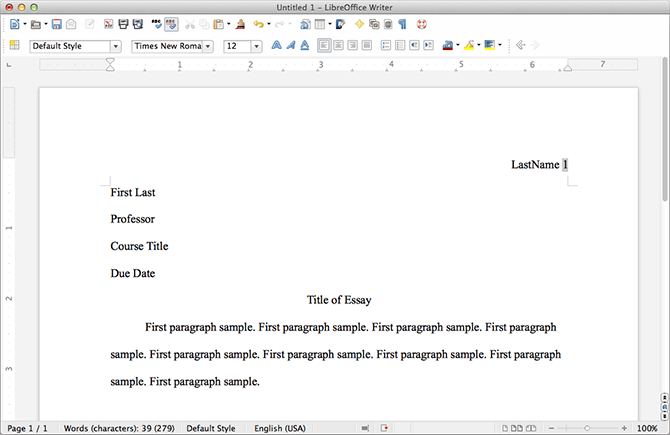 By default, LibreOffice uses font “Times New Roman” and size 12 and that’s correct so we do not need to change them. Click on the Page tab. Under Margins, set the margins for top, right, bottom, left to 1 inch (1″). Click Insert => Header => click on Default Style. Click on the Align Right icon. Type your Last Name => then press the Spacebar key on your computer keyboard once. Click Insert => Fields => Page Number (to insert automatic page numbering). Click on your document area to begin setting up your first page information. Click on Format => Paragraph. Click on the Indents & Spacing tab. 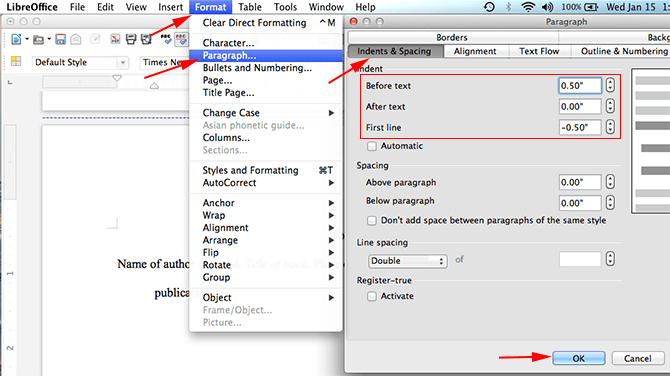 Under Line Spacing, click on the up/down arrows => click on Double. Immediately after typing the final line of your paper, click on Insert => Manual Break => click on Page Break => click OK (to begin a new page). Your header with your last name and automatic page numbering should appear at the top right of your paper. The feature to setup indentation on the subsequent line/lines is called Hanging Indent. 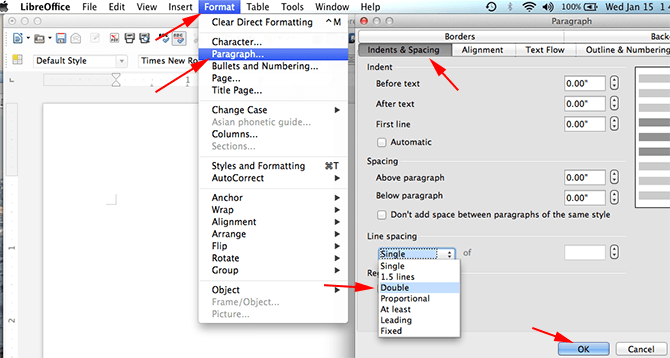 To setup hanging indent, click on Format => Paragraph => click on the Indents & Spacing tab => change the Before Text value to 0.50 => change the First Line value to –0.50 => click on OK to set the Hanging Indent. Now type your sources and finish your paper. It seems Default header is set to 1″ (Libreoffice 2017) MLA Format calls for 1/2″. In header settings there is only left and right margin options, not top, to potentially set to -0.50″. If I set top page margin to 1/2″ this will be reflected across all of my pages. How to get header to 1/2″ from top??? This doesn’t explain how to setup a cover page. Thank you so much my good sir! Handy tip for students like me that visit this page a lot: If you’re stuck on a word in your paper, select it and right click for Synonyms. Praise to the LibreOffice gods. So helpful, I was able to write an colleg entry essay in an hour! Such a big help thank you so very much! If you’re on Linux, you probably have to install Times New Roman yourself. Search for “Microsoft fonts” in your distro’s package repo. MLA style doesn’t require Times New Roman, however. While it’s probably the most preferred, you’re permitted to use any font that is legible so long as bold and italic type can be distinguished easily. Libreoffice now uses Liberation Serif but i dont see tnr as an option.